On Saturday we headed along to DL1 (Feethams) and for us, it was certainly the place to be on Saturday with an exciting programme of FREE entertainment planned. With Mr Wilson’s Second Liners Brass Band headlining the day, bringing a great mix of upbeat dance tracks whilst hot-stepping out in uniformed style, they channel the spirit of the 24-hour party people, getting the audiences dancing wherever they go. I had previously seen video clips of these guys in action, so I knew it was well worth arriving early to catch them. What I didn’t expect was to end up staying for hours but with plenty going on and an impromptu lunch date with my daughters after our voucher win, it made for a really enjoyable Saturday. Make sure you check out the video below to see why I had to see the guys in action if your a fan of 90’s dance you will love them! As well as Mr Wilsons DL1 had the Guinness World Record-breaking Axe Juggler Chris Marley and Betty Balloon as seen on Britain’s Got Talent. Joanne Lowe Dance Academy, a chance to Spin to win we were very lucky and managed to win a voucher for Hungry Horse (The Woolen Mill), the girls enjoyed the free face painting and free balloons. I remember coming to the opening weekend here back in 2016, 3 years on and there have been a few changes with a couple of the restaurants but the majority are the same from opening, at present, you have a great variety of choice on site with Nandos, Bella Italia, Estabulo, Mangobean, Subway, The Woolen Mill and Nando’s. We have visited a few of the eateries since the opening, Nandos been a popular choice amongst my friends, we also frequently visit the Vue cinema as the tickets are reasonable at £4.99 each. 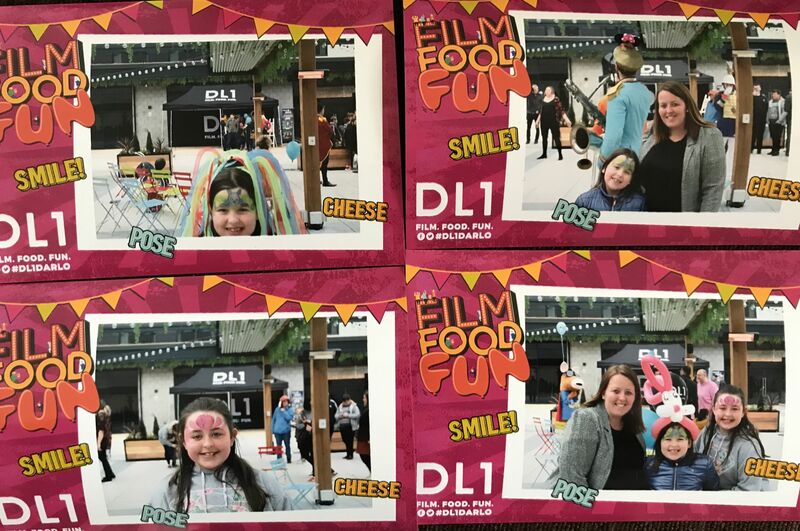 On Saturday there was a chance to sample some of the eateries within DL1, Nando’s kept a supply of chicken coming throughout the day for everyone to try, as well as Belle Italia serving up some tasty pizza slices. You could even sample some of the food from The Chinese Buffet which went down well with my youngest who loves prawn crackers. The big change since 2016 and the reasoning behind the rebrand today was the finished redevelopment work of the site which brings a new lease of life to the podium level with the installation of a pergola structure with a retractable roof, heaters and planters together with a new pop up unit. They have added a vibrant feel to an area that was, to be honest, a bit of wasted space, as the majority of the complex can be entered from the ground level. It was a large underused, empty area basically despite being surrounded by bustling businesses within the complex. So I’m really excited to see what future events and plans are to come for this part of DL1. The pop-up unit is right on trend and something that’s hugely popular in cities and I hope its something they may possibly even add a few more of around the pergola going forward, thinking of the likes of Stack in Newcastle and Spark, York. Even if we only have one in Darlington its definitely a step in the right direction in bringing the town up to date and keeping with trends. The artwork is fabulous too, eye-catching from the road as your driving past DL1. With plenty of seating and heaters, it’s a lovely warm inviting space now. DL1 have another event planned this weekend too ‘Our Big Bunny Take Over’ is on from 11am – 4pm on the 13th April. My two are upset we already have plans that day and can’t make it after having so much fun on Saturday! Darlington Train Station is just a 5-minute walk. Darlington Borough Council has recently developed a 650 space multi-storey car park adjacent. The Website for DL1 can be found here.